I am an Italian artist. I live and work in Bushwick, Brooklyn. I had never seen a real life wolf in my life until I visited the Wolf Conservation Center in North Salem, NY, four years ago. Seeing wolves up close and listening to their howls has been a life-changing experience for me. 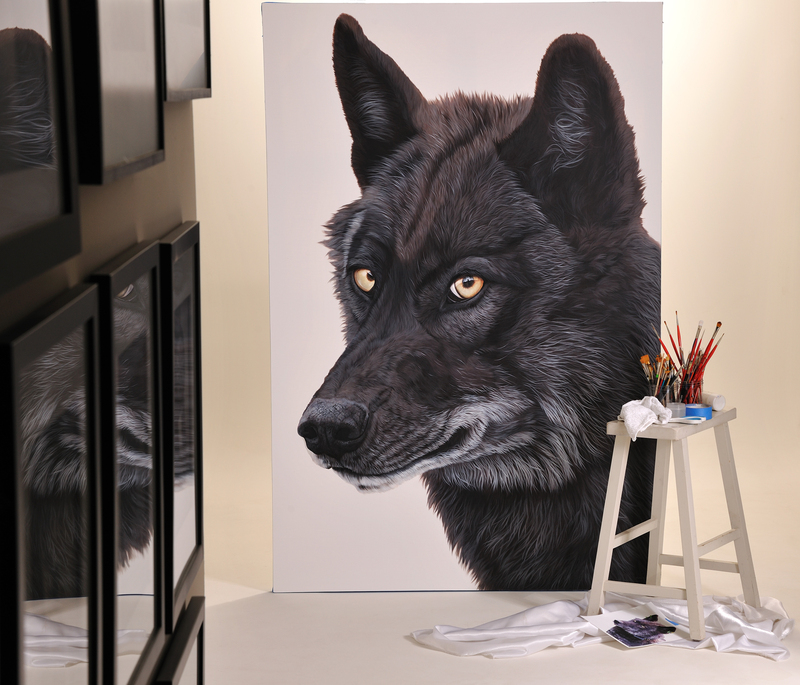 I decided to have an exhibition just about wolves, one of the most misunderstood and persecuted animal of all time. Since my first visit in a cold winter day in 2012, I have traveled to the WCC regularly for the past four years to become acquainted with the wolves and take pictures I use as a reference for my portraits. It takes up to three months to complete a painting. There are moments in life so striking that when you think about them you remember exactly what time it was, what were the weather conditions, or what kind of light came through the window. One of those moments happened when I came across Rob Klavins' blog post “A Eulogy for OR-4”. A human being was saying goodbye to a wolf, a wild one in a way so honest and sensitive that it broke my heart. “He was a good father”. I envisioned the scene, as if I was in the helicopter myself…of the 10-year old OR-4, his limping mate and their two pups running for their lives. In that exact moment, I decided that OR-4 had to be part of my pack of wolf paintings with the role he had in life as an Alpha wolf. In the eyes, I painted a vague human figure because it is up to us to find a way to coexist with these magnificent animals. We need to preserve and protect them in a compassionate way. The painting, entitled “I Was Wild. They Named Me OR-4” will be included with other works in an upcoming exhibit called “Endangered” in New York City. My aim is to connect the urban population with nature through my painting, and most importantly to raise awareness about their importance in our ecosystem. The center of my work is capturing the unique energy, essence and the spirit of each creature I paint. Isolating the figures on a seamless background is my way to concentrate only on the essential that matters to me.